9 Mournful Facts About Edgar Allan Poe’s "The Raven"
“Once upon a midnight dreary” begins "The Raven," setting the mood for one of the most recognizable poems written in English. Edgar Allan Poe’s spooky raven enters the narrator’s house, perches on a bust above his chamber door, and repeats only one word, “nevermore.” The narrator soon learns the raven has come to stay and that he’ll never be free of longing for his lost love, Lenore. 1. AS POE WAS WRITING THE POEM, HIS WIFE WAS DEATHLY ILL. When Poe was writing "The Raven," his wife, Virginia, was suffering from tuberculosis. It was a weird marriage—Virginia was Poe’s first cousin and only 13 years old when they married—but there’s no doubt that Poe loved her deeply. Having lost his mother, brother, and foster mother to tuberculosis, he knew the toll the disease would take. "The Raven" is a poem written by a man who’d lost many loved ones, and was soon expecting to lose one more. In his essay "The Philosophy of Composition," Poe describes his procedure for writing "The Raven." Every component of the poem, he said, was logically chosen for effect. For example, he selected the word “nevermore” because “the long o as the most sonorous vowel in connection with r as the most producible consonant.” When he got down to writing, he started with the climax stanza, which begins "'Prophet!' said I, 'thing of evil!—prophet still if bird or devil!,'” and built the rest of the poem around it. However, some say Poe was exaggerating about his poetic process and most likely wrote the essay to capitalize on the poem’s runaway success. 3. POE CHOSE A RAVEN BECAUSE IT COULD TALK. 4. HE ALSO BORROWED A TALKING RAVEN FROM A DICKENS NOVEL. There are also similarities between the poem and the novel. In Barnaby Rudge, one character says, “What was that? Him tapping at the door?” and another replies, “'Tis some one knocking softly at the shutter. Who can it be! 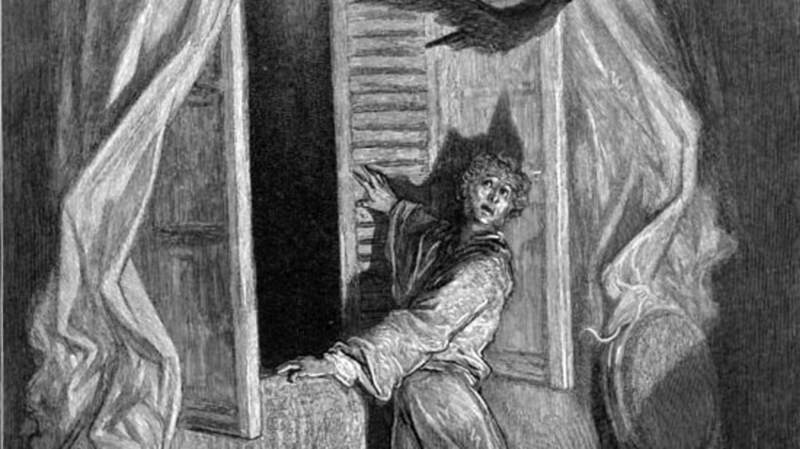 '” This is similar to Poe’s lines, “While I nodded, nearly napping, suddenly there came a tapping, / As of some one gently rapping, rapping at my chamber door.” The raven enters the house after the narrator flings open the shutter. 5. THE METER MIGHT COME FROM AN ELIZABETH BARRETT BROWNING POEM. It’s widely thought that the complex poetic meter of "The Raven" comes from Elizabeth Barrett Browning's poem "Lady Geraldine's Courtship." Poe even dedicated his book The Raven and Other Poems to Browning, writing, “To Miss Elizabeth Barrett Browning, of England, I dedicate this volume, with the most enthusiastic admiration and with the most sincere esteem." 6. "THE RAVEN" WAS AN IMMEDIATE HIT. After Graham's Magazine rejected the poem, Poe published it in The American Review under the pseudonym “Quarles.” In January 1845, it came out in The New York Mirror under Poe’s real name. Around the country, it was reprinted, reviewed, and otherwise immortalized. It soon became so ubiquitous, it was used in advertising. And then there were the parodies. Within a month after "The Raven" came out, there was a parody poem, "The Owl," written by “Sarles.” Others soon followed, including "The Whippoorwill," "The Turkey," "The Gazelle," and "The Parrot." You can read many of them here. Abraham Lincoln found one parody, "The Polecat," so hilarious that he decided to look up "The Raven." He ended up memorizing the poem. 8. … BUT HE WAS STILL DIRT POOR. Because of copyright laws, publications didn’t have to pay Poe to reprint his poem. As a result, "The Raven" made him very little money. He was so poor that he wore his one coat buttoned up to his chin to hide his raggedy shirt. He was struggling just to feed his family, keep the house warm, and care for the ailing Virginia. In 1846, a friend wrote about their pitiful circumstances: “[Virginia] lay on the straw bed, wrapped in her husband's great-coat, with a large tortoise-shell cat on her bosom. … The coat and the cat were the sufferer's only means of warmth.” She died in January 1847. Poe followed two years later. 9. WE STILL LOVE "THE RAVEN" TODAY. "The Raven" is probably the only poem that has an NFL team named after it (the Baltimore Ravens). Between cartoons, music, movies, and paintings, there are seemingly endless (okay, at least 10) versions of the poem. Online, you can hear "The Raven" read by James Earl Jones, Christopher Walken, and Christopher Lee, among others.